If you’ve been thinking about CBD for your pets and CBD pet treats, then this guide to CBD oil for pets will answer many of the questions which you may have! Just like us, our favorite furry dogs and cats have an endocannabinoid system. It’s the endocannabinoid system which allows endocannabinoids and cannabinoids to interact with our bodies and our pet’s bodies. Just like people, CBD isn’t for everyone, but if CBD doesn’t work for your pet, then it could be a life changer. There are several different reasons people are turning to CBD oil for pets, pain, appetite, seizure control, anxiety, stress, inflammation, cancer, and improved quality of life. Cannabinoids such as cannabidiol (CBD), interact with the endocannabinoid system. They bind with receptors creating a chemical reaction. Dogs and cats share a similar endocannabinoid system, but most of the receptors in our pet’s endocannabinoid systems are located in their brains. It’s important to remember that dogs and other pets can react badly to THC, so always ensure that the CBD oil for pets or CBD pet treats you purchase is 100% THC free. At Koi CBD, we have two varieties of CBD oil pet treats for people interested in giving their pets CBD. 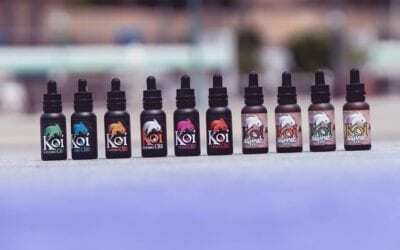 There are the Koi CBD Soft Chews, and the Koi Naturals CBD Spray For Pets, both of which make ideal delivery options for pets, no matter how fussy they are. Are there any side-effects for pets which have CBD oil? Just like any other medication, CBD for your pets can come with some side-effects. Good news, there very rare and generally minor. One of the most common side-effects which you can encounter when you use CBD oil for pets is drowsiness. Just like people, too much CBD for pets can lead to drowsiness or sedation. If you find that your dog or cat becomes sleepy or sedated after CBD pet treats, then simply lower the amount you give them next time. Start off with small amounts of CBD, and then increase it gradually until you find the best dosage for your pet. How much CBD oil should you give your pets? One of the safest and easiest ways to administer CBD pet treats and CBD oil for pets is to start off slowly and then increase the dosage over time. Start off with the minimum amount recommended, and then see how your pet handles it before you increase the amounts. Just like people, our pets are all different. They are different sizes and will react differently to the same amount of CBD. What works for one dog, maybe completely different for another dog. What should you look for when you’re choosing CBD oil for your pets? A reputable brand which is available to answer any questions you may have about their CBD products for pets. A company which isn’t afraid to have their lab results on display. A company which uses a full spectrum CBD oil.